Hi, I am a begginer in VST plugin development but have some programming skills. Just want to know if it possible to listen any GUI event from VST host (i.e. FL Studio)? For example if I want to get current (focused) generator window name/id (sawer, kick, e.t.c.) and any changing parameter name/value (cutoff, volume). Can it be done with midi messages? Now I am looking at JUCE framework for VST development. Any advice will be appreciated! Thanks. Posting this is the developer forum will probably get some better results. It's definitely possible, because Bitwig does it - if you touch a parameter in VST, then the parameter is bumped to the top spot on the parameter list. Same with Live or Studio One. 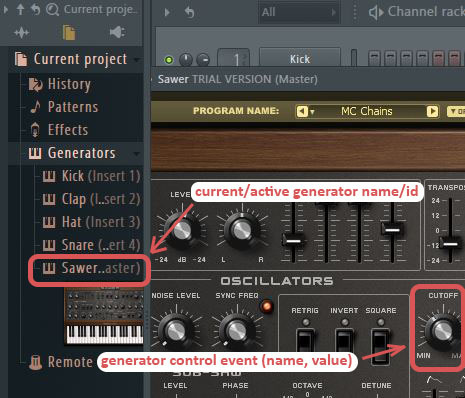 From a VST, you want to be informed of currently selected 'generator' and its parameters in host? In other words, can a VST be aware of what's going on in other (3rd party) VST/devices in the host? No. (Some products (e.g. Izotope Neutron?) have VSTs that can communicate with each other.) The host (obviously) knows about any changes to published parameters (which is what antic refers to).